Recently, a fellow history lover (Carmen) sent me a photo of her 1954-built home and said that she’d heard it was a Jim Walters’ Home. 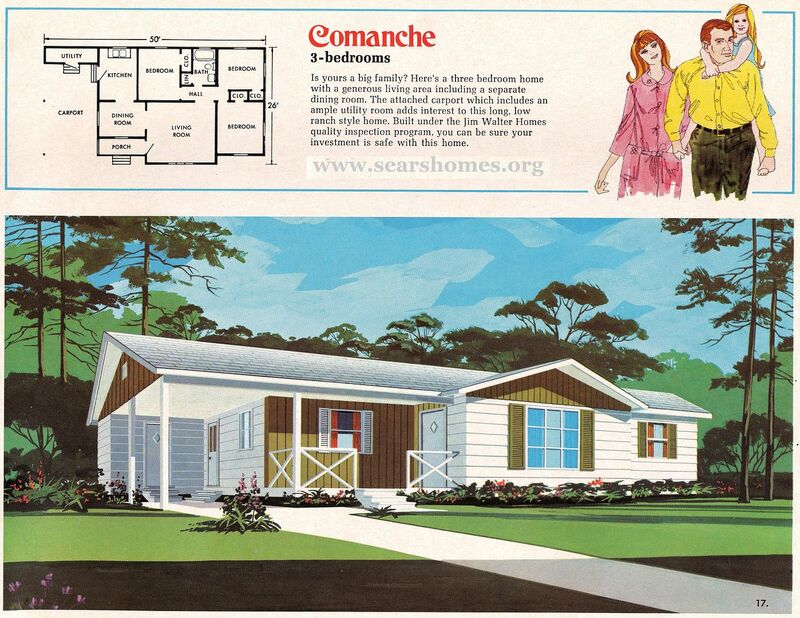 I dragged out my lone Jim Walter Homes catalog (November 1971), and didn’t find a match. However, I had so much fun looking at the pictures, I decided to scan the catalog and share it here! In the meantime, I’d love to find a few more Jim Walter catalogs. This Florida-based company sold more than 320,000 houses, which is more than Aladdin, Sears, Gordon Van Tine and Lewis Homes combined. 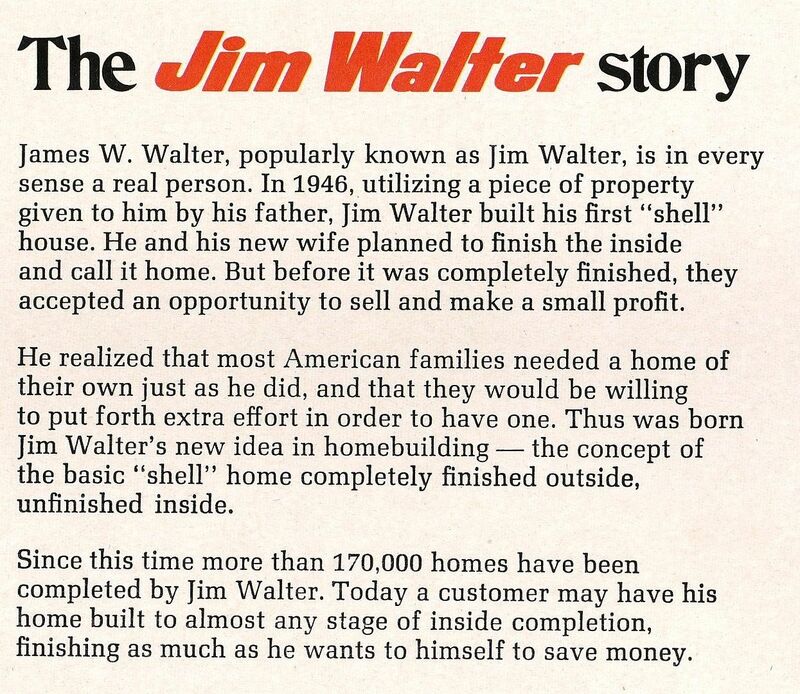 Jim Walter started his house-building business in 1946 and ceased operations in 2009. I recently purchased “Building a Business; The Jim Walter Story” (written by Alvin Moscow in 1995), and I haven’t read it all, but it’s an interesting book. According to the book, Jim Walter was 23 when his business began, and in the mid-1980s, it was one of the top-200 largest industrial enterprises in the United States. 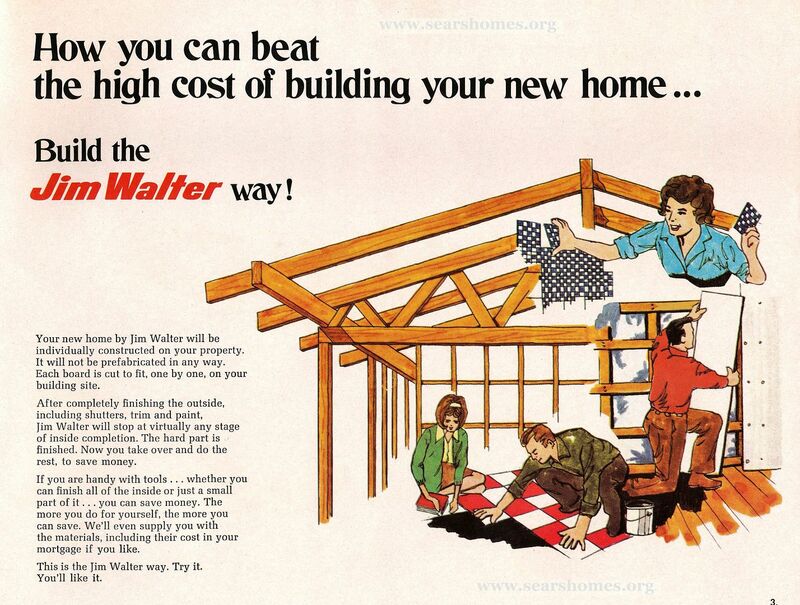 In 1961, Jim Walter acquired Celotex, a company that manufactured insulation materials that contained asbestos. That didn’t end well for anyone. According to an obit published in the New York Times , Jim Walter Homes employed 530 crews (3-5 men per crew) who would build out your home to any level of completion you wished - from shell to finished home. At its peak, Jim Walter Homes had 25,000 employees, and annual sales of more than $2 billion. 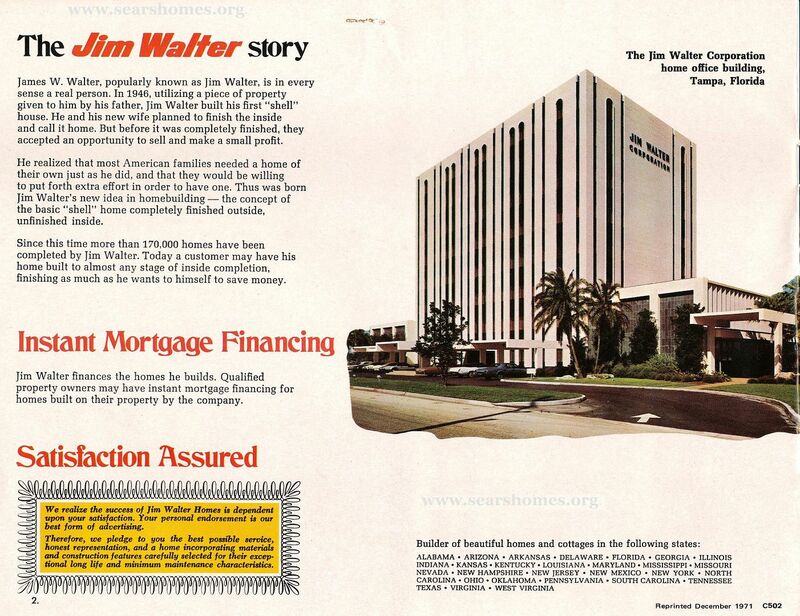 Jim Walter Homes filed for bankruptcy in December 1989, and in 1995, became known as Walter Industries. It closed in 2009. Jim Walter died in January 2000. To read more about Jim Walter at the NY Times obit, click here. Click here to read my favorite blog. Feel like going down the rabbit hole? If you enjoyed reading this item, please share it on your Facebook page! Photo is from "Building a Business; The Jim Walter Story" and is reprinted without a smidge of permission, so we're going to hope that the publisher (Pineapple Press) puts this photo under the broad umbrella of Fair Use, which includes "quotation of excerpts in a review of criticism for purposes of illustration or comment" (from the 1961 Report of the Register of Copyrights on the General Revision of the U.S., Library of Congress). Does this mean I need to write a short review of the book ? Haven't read it cover to cover, but it looks like a swell book. Does that count? 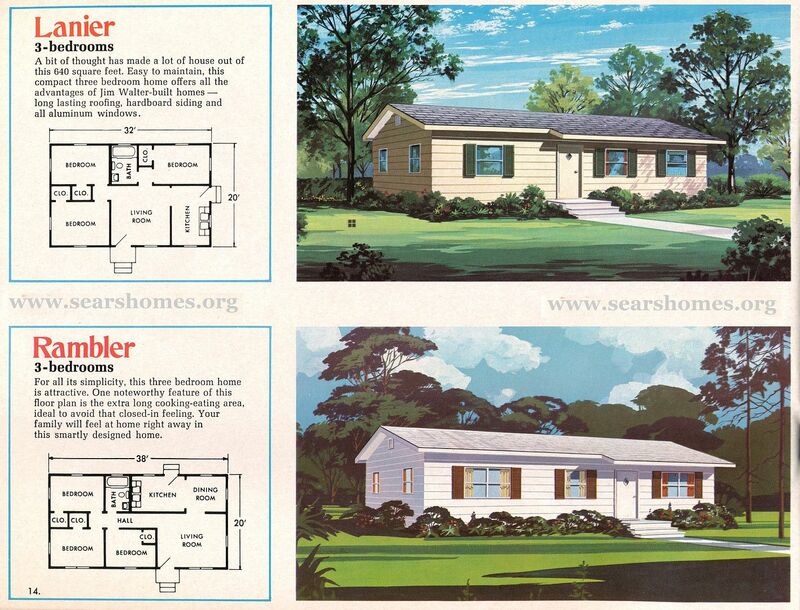 Cover of the 1971 Jim Walter Homes catalog. I'm such a sap for history. I wonder what this building is used for now? The Jim Walter Story, as told by corporate copy writers. BTW, that 170,000 is of 1971. Does that mean they doubled their sales numbers by 2009? Hmmm...that's a little hard to believe. It's plausible, I suppose. Men work. Women pick out swaths of fabric! Oh dear! I'm not sure what Missy is doing on the floor. Check out the text. 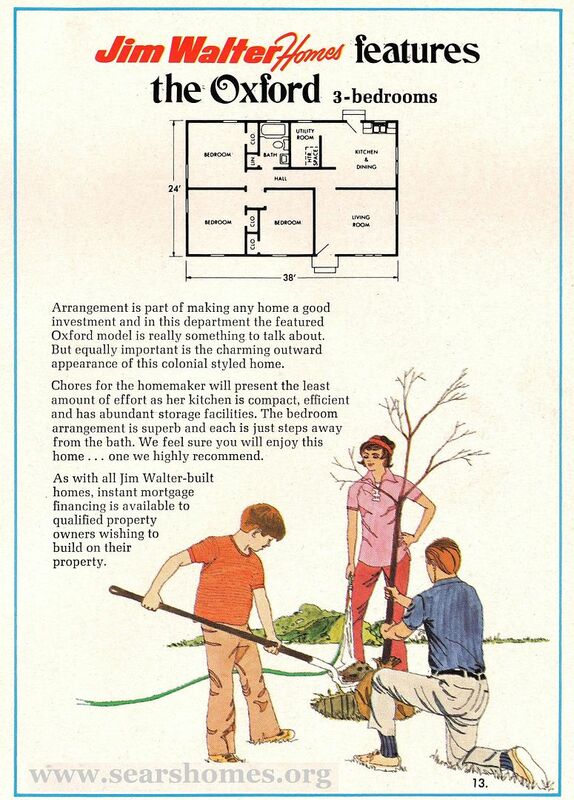 "Your new home...will not be prefabricated in any way. Each board is cut to fit, one by one, on your building site." That's a puzzler, isn't it? I would have thought this lumber *was* precut! And I thought identifying the Sears bungalows in an early 1900s neighborhood was tough? Oh man! These houses are quite "simple" (to put it gently). Simple, but an affordable way to have three-bedrooms and a home of your own. Straight-forward design and a mere 760 square feet. The "Biscayne" kinda looks like the 1970s version of the cheapest way to cover air. "Can you imagine the overwhelming joy of your family?" The kid in the corner looks pretty morose, but the old man looks content. This photo is a bit creepy. 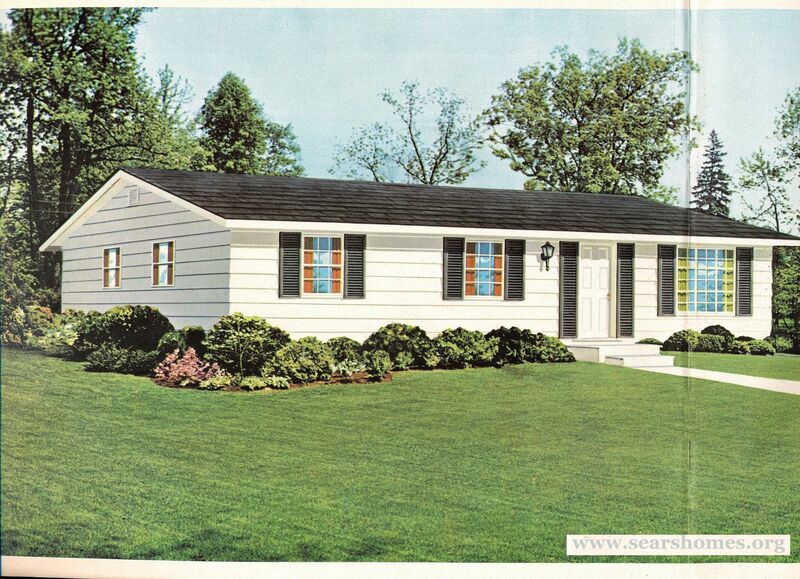 This appears to be the biggest house in this catalog, and it's a mere 1,142 square feet. The names are fancier than the houses. Hollywood? Is this the kind of house that Jolie Whats-her-name would buy? I'd have named the 2nd house: "Rebel without a flaws." Grammatically messy, but cute. Have you noticed that the front door on each of these houses has a small diamond window? The Oxford (description below) got a full-page spread. Should someone tell Mom that she's wasting water, and probably aggravating the living daylights out of Dad? 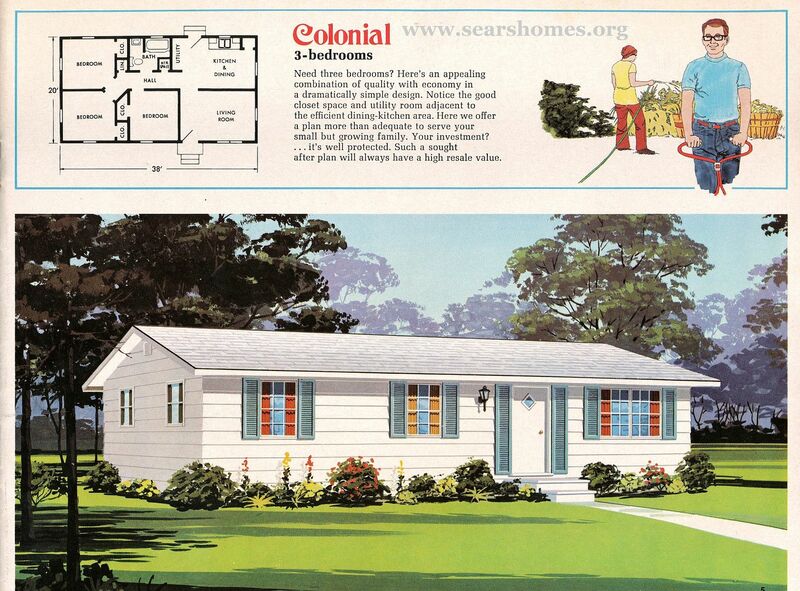 Notice that the house is described as "Colonial Style"? I guess it's the coach light by the front door that does it. Is "The Rambler" prone to run away in the wee hours? Or does it talk excessively? Or is it the size of the house? It's hard to say that a 760-square foot house is a "rambler." If you're old, you'll like this house. "Just plain good living...is what this plan has to offer." This one actually has a little bit of flair. Were Comanches known for their big families? The word for Comanche comes from the Ute word, kɨmantsi (enemy). What were they trying to tell us about this house? They appear to be of European descent. Mother's right hand is disfigured. Apparently, she hides the left hand in the pocket of her atomic housecoat when photos are taken, as it's the more seriously disfigured appendage. Dad graciously tries to look in the other direction. It does have a little more "flair" than the other JW homes. Still only one bathroom, though. Carmen recently purchased a house that was identified as a Jim Walter house and asked me if I recognized it. Unfortunately, with only one catalog, I can't say that I do. And here's the obituary that appeared January 8, 2000 in the Tallahassee Democrat. Do you have a Jim Walter catalog you’d love to give me for a Christmas present? Please leave a comment below! Read about The Little Tower House by clicking here. Very interesting to see so many different designs of the small house. It makes me feel fortunate to have just a bit more than most of them advertise. I live in a neighborhood of 3br ranches, mostly National Homes. Mine, however, was 10 years later than the majority. At 30ft by 40ft, I always thought mine was small until I saw these. That said, these were the homes that were affordable. Why won’t anyone build them again? Not every dream has a 4br 2-1/2 bath with a basement. Thanks Rosemary for a wonderful article and the pictures. 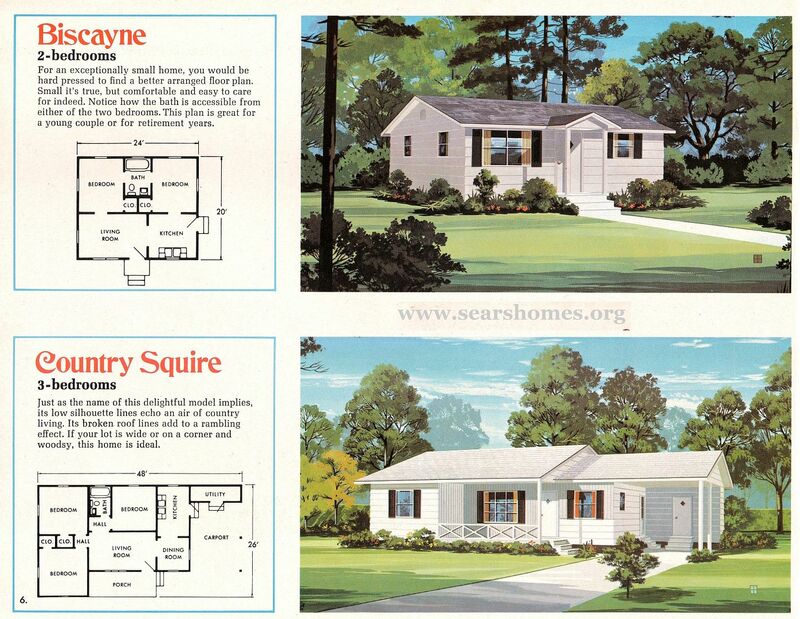 Rosemary ~ I think someone has been selling a stack of Jim Walter homes catalogs on eBay for a while now. I didn’t pay too much attention to the details ~ just that they showed the counter display box they all came in within the listing. It keeps popping up when I check on some of my search parameters I keep on eBay. I will check it again and see if there are any besides the 1971 issue you mentioned having already. Wow, Shari, I’d **LOVE** to see those! Please let me know if you find it again? Greetings from Tampa, FL! Thanks for the write up and pics. 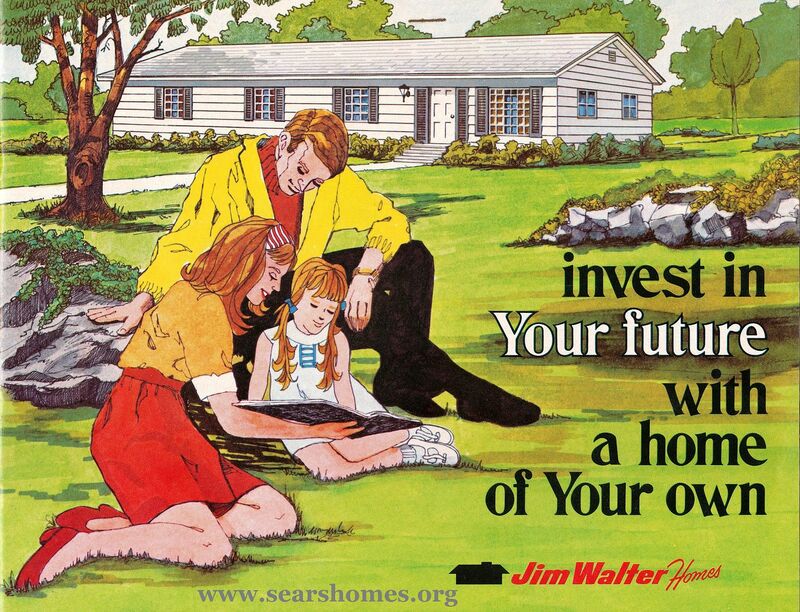 A google images search of ‘Jim Walter Homes’ brought me here. I’m a Tampa native and can tell you Jim Walters was HUGE down here back in the day. As you mentioned in your write up they fell on some hard times in the 80’s and the company became a shell of what it used to be. 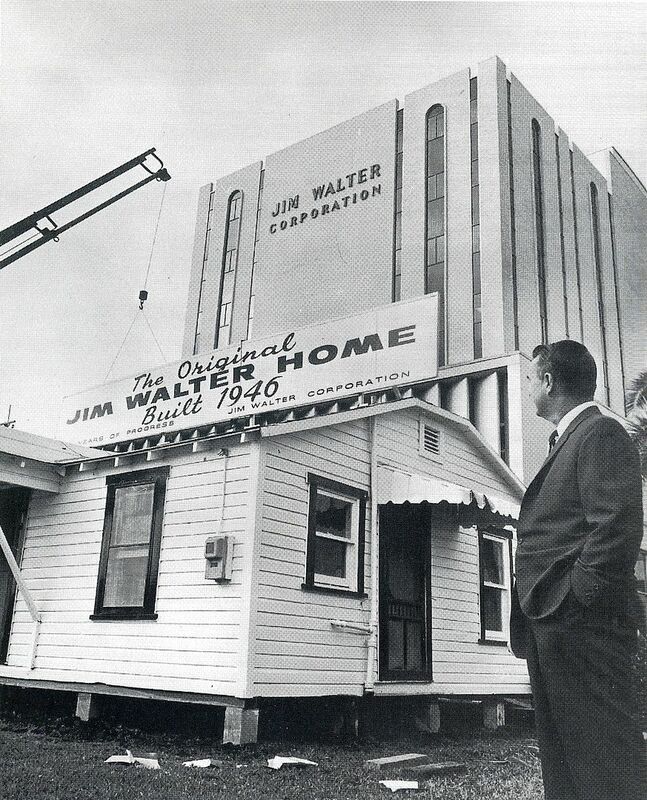 You can tell this photo was taken after 1995 since it shows ‘Walter Industries’, not ‘Jim Walter Homes’. This was a pretty iconic building back in the day…at least to Tampa natives. It was north of downtown so with no other tall buildings around it really stood out. It was very close to the old Tampa Stadium. The building was torn down 10-15 years ago (ish). The site is now a Target, a health food store and a large pet store, complete with 2 story parking garage. I just looked at these homes by Jim Walter. Jim is The Man. I absolutely LOVE The DIAMOND WINDOWS On the doors. I wish they still used those style windows on front doors today. Thank you for sharing this! I too, am trying to figure out what my home is. 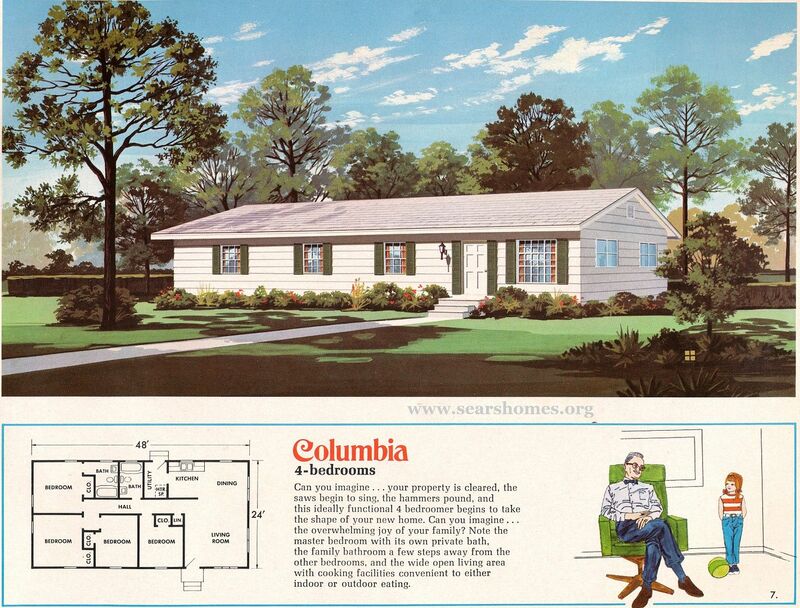 It’s very similar to the Columbia except with the entry point being where the utility closet is at and there being a staircase between the kitchen and living room. Where can I find more magazines? My home was purchased in 1966, in Woodbine, Georgia. It was a “shell” (unfinished), and it was The Lanier. The house is still in our family. My brother and I inherited it, and we’d like to remodel it. It’s been a good home. I’m trying to find a picture of a Jim Walter’s one-bedroom home, with an unfinished interior. The model I’m looking for was about 20 feet square, and was offered in the early 1950s. 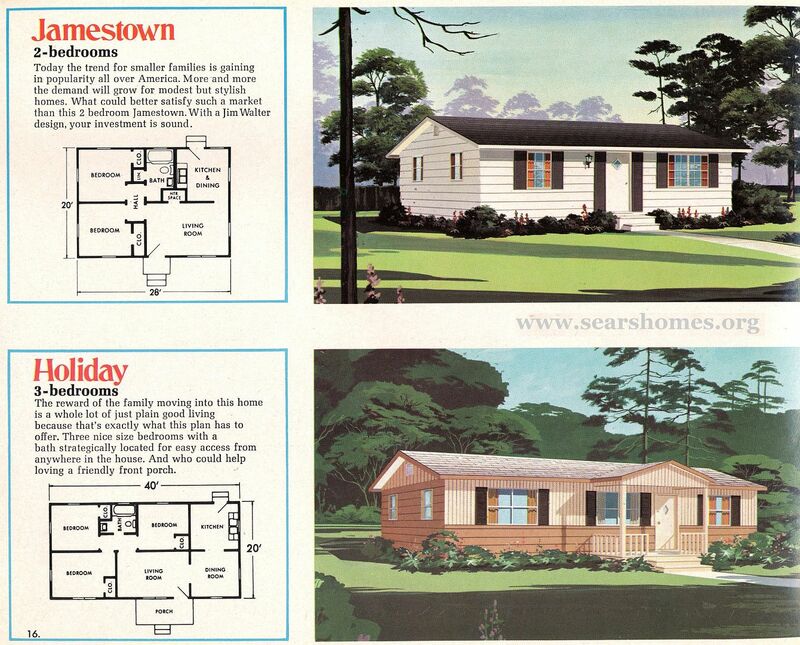 I enjoyed seeing the JWH home plans. My first REAL job was in accounting at the Jim Walter Homes home office on Dale Mabry at I-4 in Tampa in the mid-70’s. While the memory has faded (LOL! ), back then I would have been able to tell you exactly what the specs were on the houses. Since JWH employed local subcontractors in all their locations, some homes were built better than others. Sorry to hear they were a victim of the economy in ‘09. Hi, I came across your site when looking up Jim Walters Homes. I am from Pensacola, Florida. My in laws both deceased had a Jim Walters Home built in late 1940s to early 1950s. I have video on VHS tape of the home inside and out. 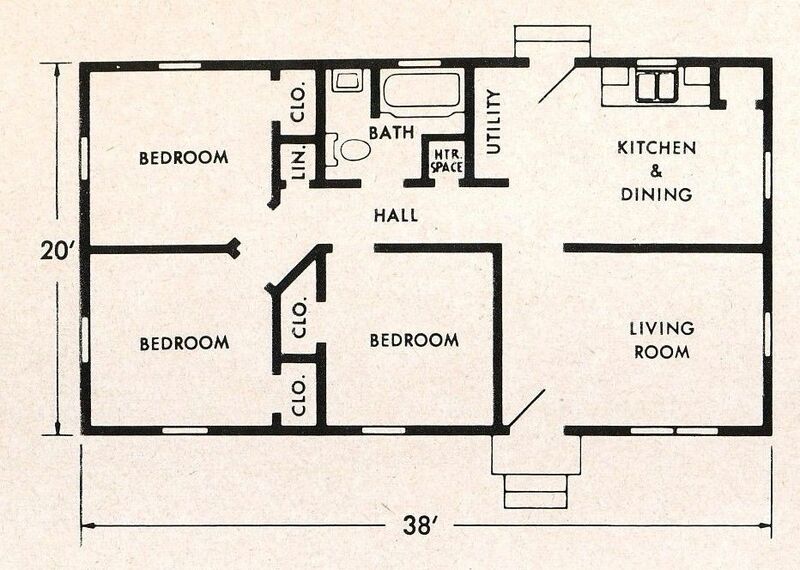 As I recall the home originally had 3 bedrooms, tiny bathroom, you would literally sit on toilet with sink almost in your lap, and bathtub right next to you on the left. The bedrooms were tiny, a small closest in two bedrooms and none in the third smallest bedroom. Had a small dining area next to kitchen and small living room. 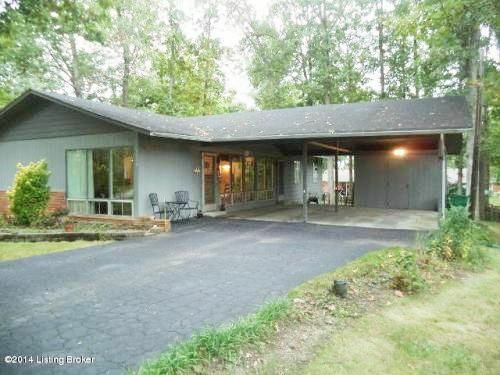 They later added a living room and made original into a dining room and added a carport. The house has been through many hurricanes and still stands today abandoned in the piney woods of Florida. Thanks so much for sharing! My grandmother lived in a 2-bedroom Jim Walter home. It was built sometime in the early ’60’s. I fondly remember spending holidays there. She had 5 children and 10 grandchildren, so there were too many of us to comfortably gather inside. Fortunately, it was warm enough in Louisiana that we could play outside. Thanks for the stroll down memory lane. Your note mentioned you’re looking for a home of 20 square feet. I’m thinking you may have meant 200 square feet. 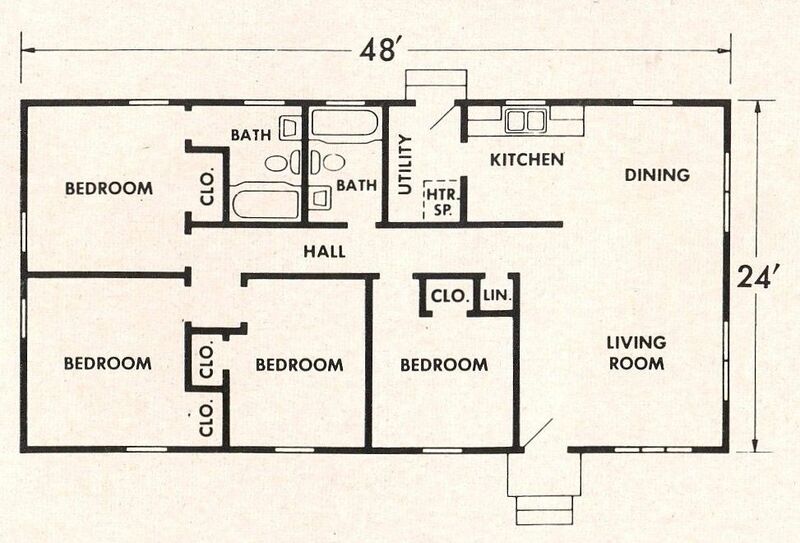 Do you have the islander floor plan image? I really think that Jim Walter homes is the best for young people with a vision they are very professional. I have been living in my Jim Walter home for a long time. I have paid for my home raised my three sons as well. It is a twenty year mortgage with a fixed rate. I really love Jim Walter Homes and the people that work there. Thanks Jim Walter for making my family dream come true. I came across your site while looking for information on Jim Walter homes. I live in a Jim Walter home that was built in 1979. However, it was not built to be used as a home. It was one of the hunting cabins that was built on Jim Walters private ranch located in Duette, FLA. I was told that my home was used by his Ranch Forman after the main hunting lodge was built. That one is located in the woods on the ranch. I have been told that it is a mansion. It has it’s own heliport. I have never saw it. There are several other Jim Walter homes built on the ranch as well. All of these homes resemble in style. Mine is a 3 bed room and all the bed rooms have their own private bath. It also has a butlers quarters with it’s own bath that is located on the other side of the drive through garage. There is a wet bar in the living room, a huge stone fireplace, and red cedar ceiling beams, and cedar walls in the living room. 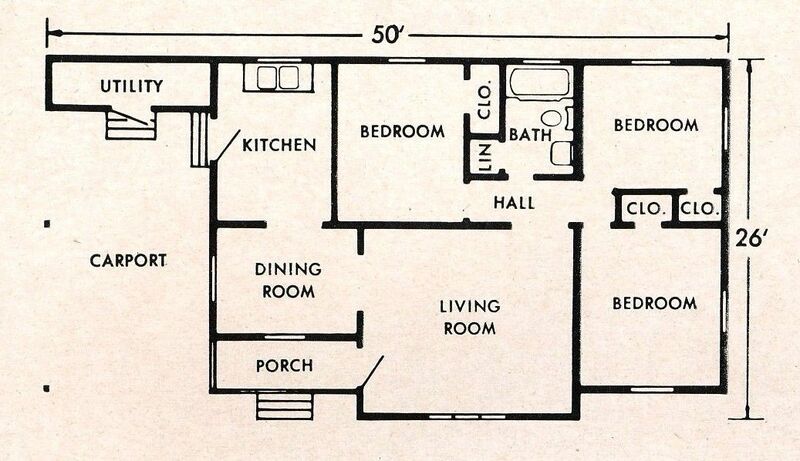 I’m sure this had to be one of the Jim Walters house plans. 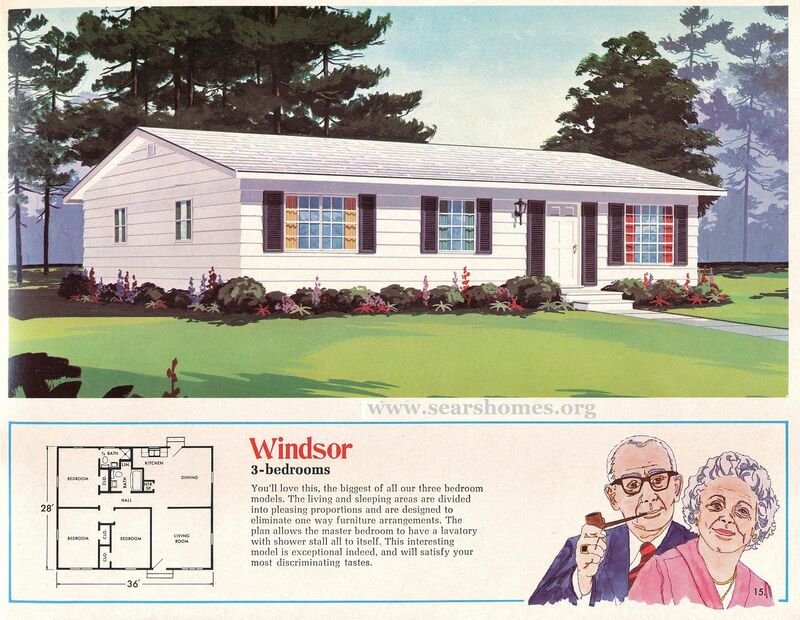 Can anyone tell me what style home this is, and where I could find an original ad? I would like to have it as a piece of history to the house/cabin. I have a letter from December 1956 that my grandfather wrote to J. W. Walters. Mr. Walters replied on the back of my grandfathers letter and signed it “J. W. Walters,” 22 Walters Lane, Ft Thomas KY.
Could this be the same man since I see he was from the Tampa area? The letter discussed a home my grandfather liked and was asking for more info on the design of the house and price. Mr. Walters responded, giving the home’s approximate cost and a hand-drawn plan of a two story house. My grandmother lived in a tiny house in Tampa, Fl, from 1949 til she passed in 1979. I do not believe her house was a Jim Walter, but next door to her were two extremely small houses that I was told were Jim Walter houses. I was a child at the time, and when they were vacant, I went inside. I am pretty sure they were one bedroom. I have a picture taken from my grandmother’s front yard that shows one of the houses, partially blocked by tall yucca plants! Not sure how to do it, or I would attach the pic for you. 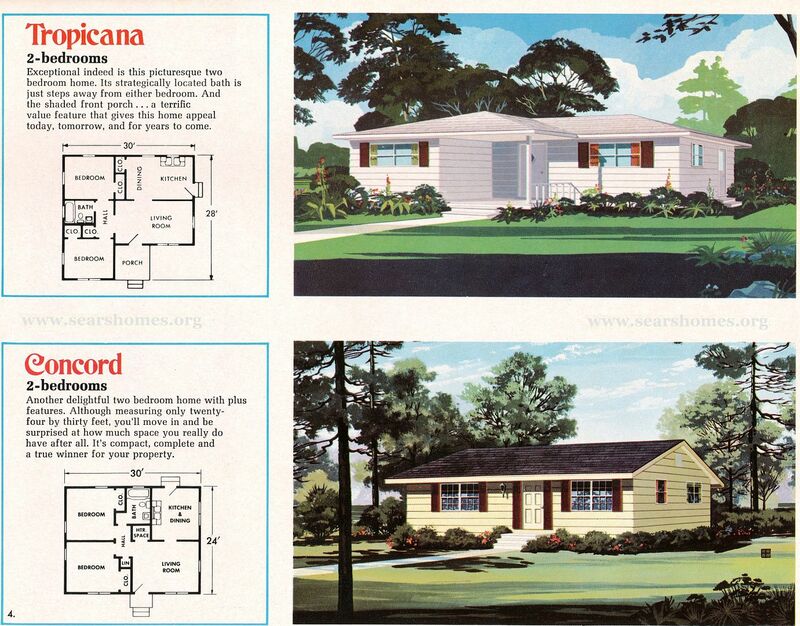 Interestingly, My husband and I recently purchased property (in Tampa) with a small 1950’s JW house, which we have restored as a guest cottage. It is a 2 bedroom. 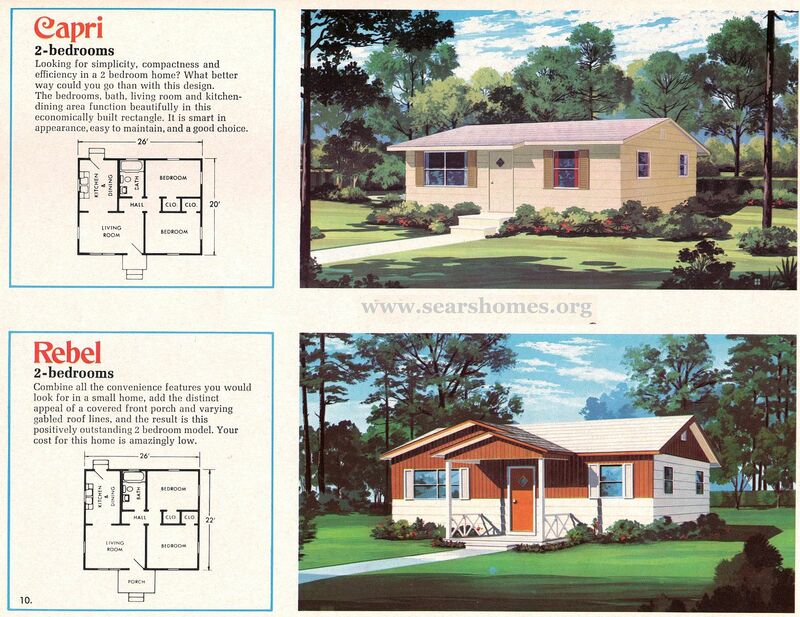 I have, too, have been poking around the web for info, pics and/or plans of the original wood frame Jim Walter homes. Enjoyed this website! Can you name a modern-day builder that’s doing kit homes in the North Carolina area? I’d like to get a phone number so i can talk to someone about building a Jim Walter Home. they went out of business in 2009; The last home delivered in Jacksonville, Florida. 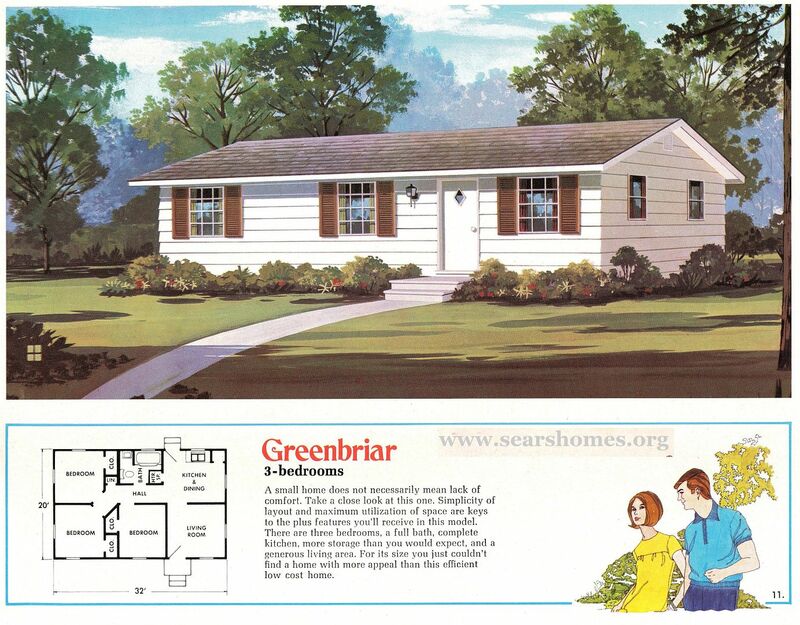 I’m bought an” Oxford” JW home in Gautier, Ms built in 1984, doing a remodel and may sell next year. Was not taken care of, but the bones were good, foundation and framing is in almost perfect condition, so cosmetics and popcorn removal is a must and opened the kit and Living room up. Will update at this post next year. 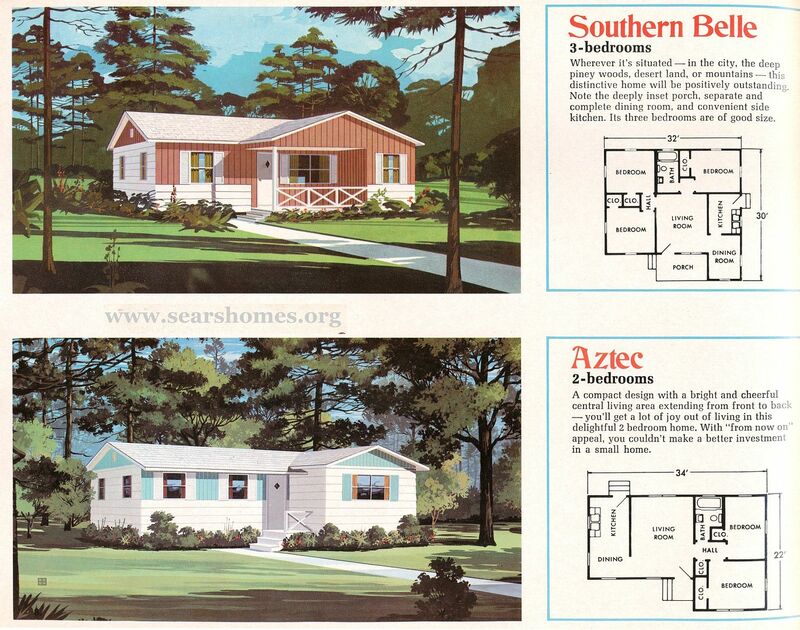 My uncle and aunt sold Jim Walter homes for a decade so I am very familiar with their sizes and layouts. My own family’s home, like the other homes In our neighborhood, was not appreciably different in size, layout and elevation from the Windsor shown above, just constructed with better materials (brick, eg). More importantly, our neighborhood was considered upper middle class, and our neighbors included a local TV personality, the manager of the local RC bottling plant, and a bank VP. These houses did not feel tiny to us. You forget this is how people lived in those days. 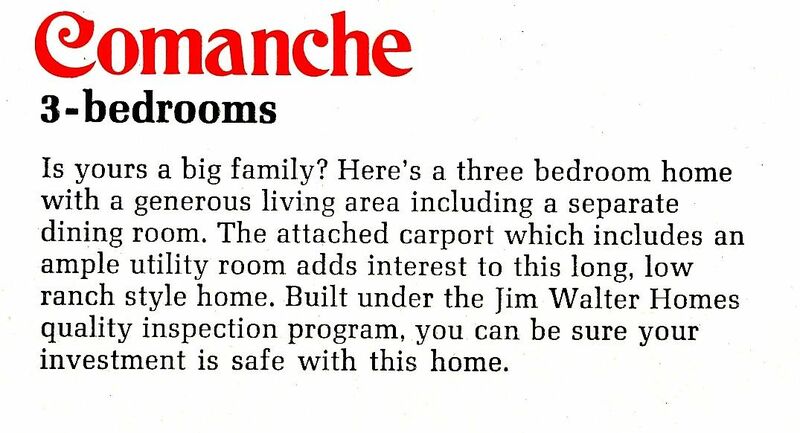 I am also looking for Jim Walter home brochures. when I was a young girl in high school,my mother had a Jim Walter home built. It was built in 1974. It was called the Lexington. I have loved these homes ever since. 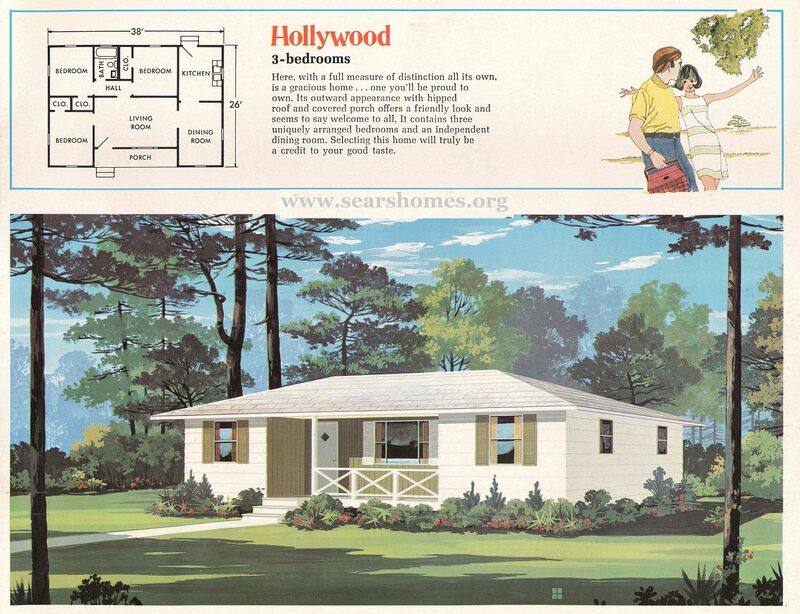 I have been looking for the catalog with this home in it. I just love to sit and look at the pictures. 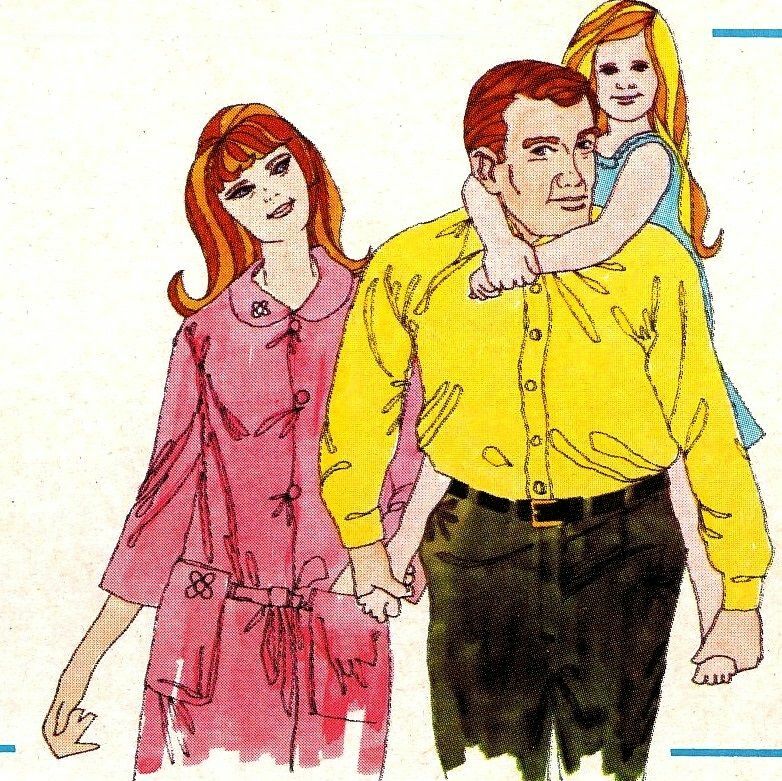 I have the 1971 catalog. Jim Walter catalogs show up on eBay once in a while. I don’t find that any Walters catalogs have been archived by a library or university but perhaps someone will prove me wrong. There are a few catalog illustrations on Pinterest. I would love to get my hands on some other Jim Walters catalogs, as they apparently had more than a few sales here in Hampton Roads, too! Any luck finding the Lexington home? I have been searching the web but still haven’t found it. I sold 6 houses for JW back in`97. I liked working there in Henderson KY too, it was great. I sold houses for another outfit 2 years later and that was alright, but I can tell you that JW was still ” family” and a good home to have. I was saddened by Mr. Walters passing. He was a good guy and unfortunately could never be replaced. I’ve had a lot of jobs but that was one of my favorites (as you can tell). Buried in my stuff I may have a catalog, the 50th anniversary catalog was gold colored, and very nice but it rubbed off on my hands while looking at it. I think these houses are beautiful I would like to get the phone number so I can call I want get a house built on my property. Jim Walter Homes went out of business in 2008. If you look online for modular or prefabricated home manufacturers in your region you should be able to locate a company that makes prefabricated homes they will deliver to your property. Most manufacturers offer a wide variety of models from very basic houses to surprisingly elaborate and large residences. Where is your land at, approximately speaking of course. I may be able to refer you. I like many JW models too. I live in the Southern Belle. My parents had it built in 1984. My parents’ home was a 400-square-foot Jim Walter’s Home. I would love to know the model name. Four hundred square feet is pretty small. If you’d like, you can send me a picture of the house at pennimanva@gmail.com. I would like to get a catalog sent to my home. Elaine, the only way I know to find a catalog is through eBay!! Oh MY! Look What We Found in Herndon! The Little GVT Tower House Mystery: Solved!